Ikkunastani 25 x 19 cm, oil on canvas. 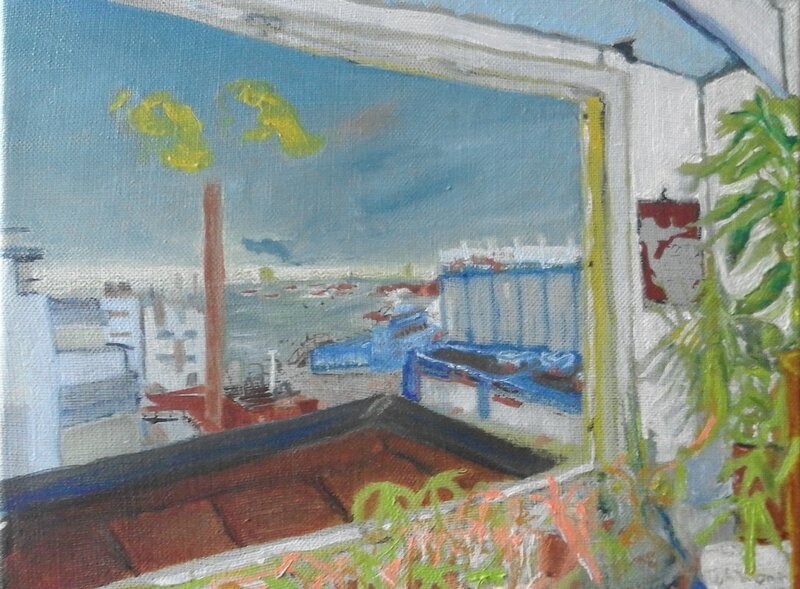 Ikkunastani ('from my window') tells story about the eyes of a Hernesaari inhabitant through landcape and its abtraction, in watercolour and oil paintings made between 2011 - 2017. The severely cropped landscape paintings immediately take away the possibility of seeing the landscape, yet there it is, visible. The permeating abstractions of lines and walls reveal an obscured sight that projects itself back into the world without really seeing anything besides its own path to what it wants. The inhabitants eyes morph from the landscape. Rather than trying to achieve parity, colours criss cross through themes or are marked by their opposites. Even the buildings slowly morph into boxes, lines and jewels, amounts remain even when the proportions are forgotten. The landscape stretches and the sea lights up in the night. At the same time the exhibition reflects on the political subject who lives in a Hernesaari, which is about to be completely reconstructed. What does the continuous city planning entail as an embodied experience? Is anything ever ready? How much does sight change from the morphing landscape? Does anything but a projection of what was wished for remain?